People with cats that live in an appartment complex that is far away from the garbage container outside can definitely make use of Litter Genie Plus, because you can store multiple cleanups of the litter box in this pail, before you need to take it out. The Litter Genie Plus is an excellent way of storing used up cat litter for people who don’t like to walk to the garbage container outside everyday. Especially people that live in an appartment complex where a walk to the garbage container means going down several flights of stairs and maybe a couple more meters to the nearest garbage containing storage unit. Some appartment owners have to even use special RFID key cards to open and close a container before they can throw their garbage. As you can figure, having to walk to this container and open and close the container for each bag of cat litter each day is a tiring and tedious job. We live in a house with direct access to street level and big containers for garbage outside, but we still wanted to give this pail a try. For us it isn’t hard to get to the garbage container outside, but there are times it can still be handy to not have to go to the container for every scooping through the litter box. After all, we got the extremely cold and snowy winters where taking garbage out often means that you need to clean the stairs, a path to the container and the container itself before anything can be dropped into them. A country that also receives a lot of rain, means that you need to put jackets and proper shoes on before hopping out to put a garbage bag into the container. Even we, not living in a tall apartment complex, do still see the need for the Litter Genie Plus. We can now keep the soiled litter within a bag without it stinking away for more than a week, before we need to take it out. With the Litter Genie Plus you no longer have to keep running to the community garbage container outside, because the soiled cat litter can stay in a pail that seals awful smells perfectly away. Anyone with cats has certainly been cleaning a litter box before and should therefore know what smells come from the used up cat litter. You usually put this in a plastic garbage bag so that you can get rid of it as soon as possible. The smell is enormous, especially now that it is getting concentrated urine and feces smell within the now filled up bag. The bag isn’t really full yet, but keeping the bag in the house will keep every family member and friend away from visiting you. The only solution is to knot it up and take it outside. Urghh.. again down the many flights of stairs and into the container. Or in our case, shoes on, jacket on, is there snow to clean? take the bag out in the rain, open the container, drop it in (heavy! ), close the container and get back into the house. The Litter Genie Plus is a pail or container to store away the used kitty litter and keep it stored away while not having to deal with the extremely concentrated smells. The Litter Genie Plus uses a special locking mechanism that makes sure that no nasty smells will escape the bags or the pail. You can have this pail within your house without anyone smelling the litter stored there. It is quite amazing to think that there is extremely stinking cat material stored in a box and you don’t smell this at all! Let’s take a look at the main features of this amazing device. The Litter Genie Plus locks litter and odors away through a locking mechanism. Every time you open the container to add more used litter (clumps) to the box, it will open up and when you close the lid and push the handle on the front of the pail, the bag will lock the smells and litter in. This way it is impossible for bad smelling kitty poo and kitty pee to come out from that bag and pail. The Litter Genie Plus also comes with a antimicrobial coating on the pail that keeps bacteria away from breeding on your pail. To keep everything together in one place, the pail has a convenient storage space for the scoop on the side. After you scooped the clumps you simply open the litter box by opening the lid and adding the soiled litter to the box. When you are done you simply pull and push the big handle on the front of the pail to let the litter drop down into the bag and get sealed in again right after. As long as you know how to use the system, it is quick and easy to use the Litter Genie. Bacteria that would stick to the pail, would create one of the bad odors and smells. The material of the pail and the layers of coating on it are antimicrobial, so that bacteria’s can not form or stay on it. This will in turn give a non-smelling and anti-bacterial pail. You don’t need to do difficult handling to exchange garbage bags for this pail, as you simply switch out a special container that contains the bags. The refill bag container contains 7 bags for cat litter. Each bag should last about two weeks, before you need to take a bag out and deploy a new one. How long a bag lasts, depends naturally on the amount of cat litter your cat(s) produce and the amount of cats you got. The calculations here are based upon 1 cat environment with 1 cat litter box. The biggest advantage of minimalistic and compact design is that you can fit this box anywhere and hide it, while keeping it nearby for the next scooping. It can be comfortably stored nearby the litter box underneath a table or inside a kitchen cupboard. Easily out of sight, but still nearby to be useful. Open the lid of the Litter Genie Pail and dispose your litter garbage. – repeat step 2+3 until litter box is clean. Pull the front tab out, the litter will fall through to the bottom of the bag, push it back in to close it. When the bag is full, you remove the bag and knot it up to take it out. The next bag will follow from the refilling box, you got 7 bags per refilling box. Q: Does It Come With A Scoop? A: Yes, the comes with a scoop. The scoop fits nicely in a pocket on the side of the box / pail so that you keep everything well-organised and together at one place. Q: What are the dimensions of the Litter Genie Plus? Q: How heavy is the bag when the bag is full? A full bag can weigh anywhere between 4 pounds and 10 pounds (2-5 kg). If you cannot carry such weights, make sure to take out the bag before it gets too full. Q: Do you need special litter for this? A: While you don’t need special litter, it sure helps making the scooping job easier when you use a good clumping cat litter, such as the Clumping Cat Litter from Arm & Hammer or Tidy Cats. Q: Standard refill vs Plus refill? 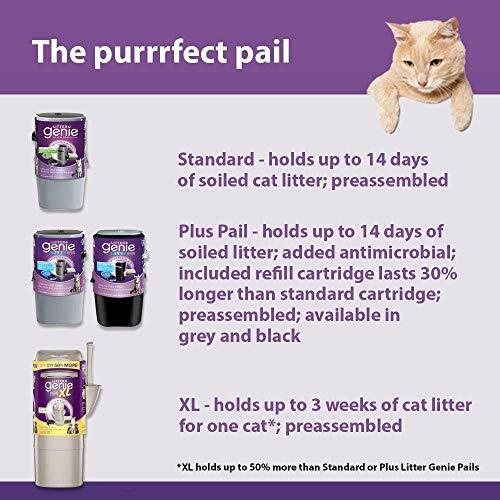 A: You can use both types of refill cartridges for the Litter Genie Plus Pail. Q: Are there alternatives to the refill cartridges? A: Alternatively you can even use a normal garbage bag for that container size, but you will have to use an empty cartridge to keep the bag in place with. With the Litter Genie Plus you no longer have to keep running to the community garbage container outside, but you can scoop happily your cats feces and urine away and keep the smells inside the litter pail. Nobody needs to smell a smelling half-filled bag in the passage, because the bag is now sealed away through a locking mechanism and a lid. This easy to use and convenient litter storage unit will save you both time and money. I can appreciate the use of such a pail. It can be very inconvenient to have to take the litter waste down so often. This seems like a viable alternative. My concern is-does the pail offer a way to keep the smell of previous deposits from wafting out when you add more waste to it? I am concerned that after a week there could be an enormous smell. Could you please explain on this further? The Litter Genie Plus does not really keep smells from previous deposits to waft out when you add more waste to it. You’d be better off with the Litter Locker II. Depending on the cat litter you use, the smell could potentially be horrendous when you open the lid. It doesn’t have to be a problem though. As soon as you close the lid, the smells are gone and life continues. Scooping in the litter box is anyway a dirty and smelly job. The use of the right type of cat litter can also help the situation.